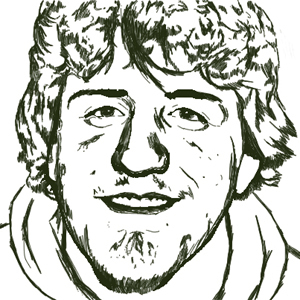 I've been a fan of TWiT for about 6 years now. As a long time fan, my girlfriend decided to get me a TWiT brick for my birthday. It is a contribution to help build the new TWiT studio, but I get a brick with "UnitVectorY Jared Hatfield" in the lobby of the TWiT brick house. 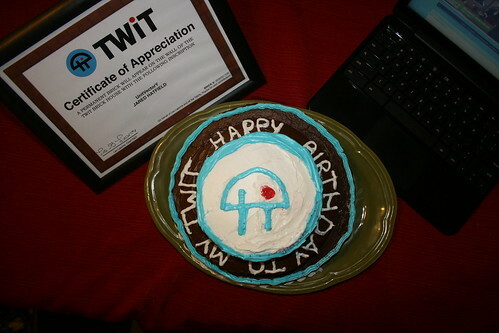 To top things off she even made me an awesome TWiT themed birthday cake! 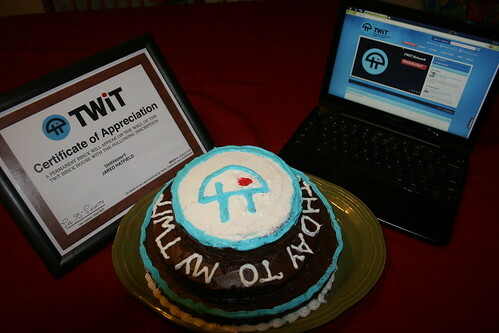 You can see in the above pictures the Certificate of Appreciation that I received (my replica brick AKA paperweight is still in the mail), my awesome birthday cake that includes the TWiT logo and reads "Happy Birthday to My TWiT", and my Chromebook showing the TWiT website.